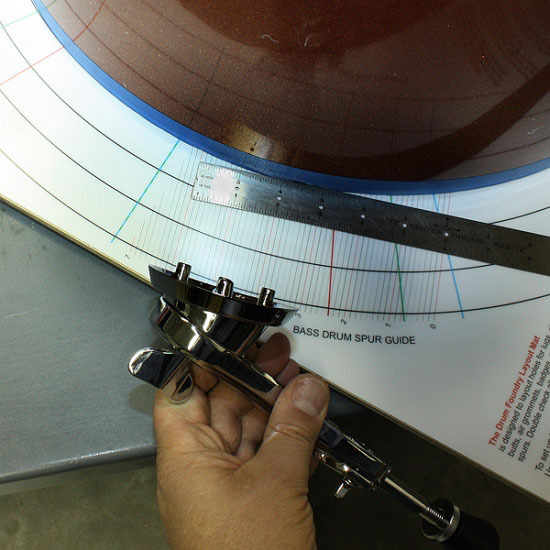 The DF Layout Mat has spur alignment guide lines on the left and right side. These will help you make sure your spurs are mounted in the exact same place on both sides of the bass drum. 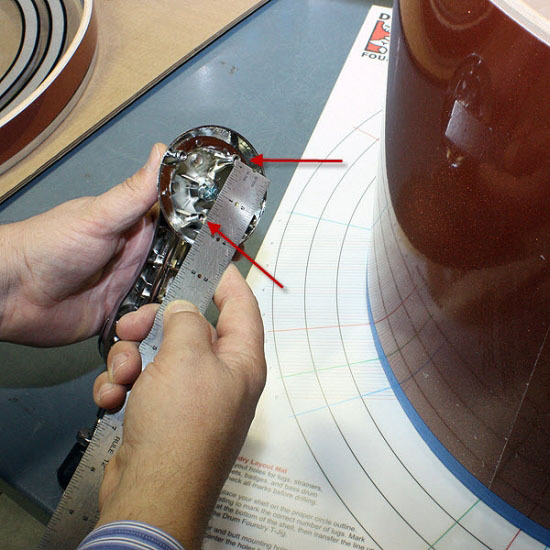 First, make sure you are mounting the correct spur on the correct side of the bass drum. Most folding spurs will mount in the 3 to 4 o'clock position and the 8 and 9 o'clock position. Spurs that disappear into the drum usually mount lower. We suggest that you look at a picture of a finished drumset and take note of the spur position. 1. Measure the distance between the top and the bottom mounting stud. These two mounting studs would be the ones that are closest to the top and bottom of the bass drum when the spur is mounted. The particular spur shown has 4 studs, but some only have two, others have three. The measurement on this spur is 1 3/4". 2. Because the bass drum is facing down on the layout mat, the "top" and "bottom" studs are on the left and right side of the picture. 3. 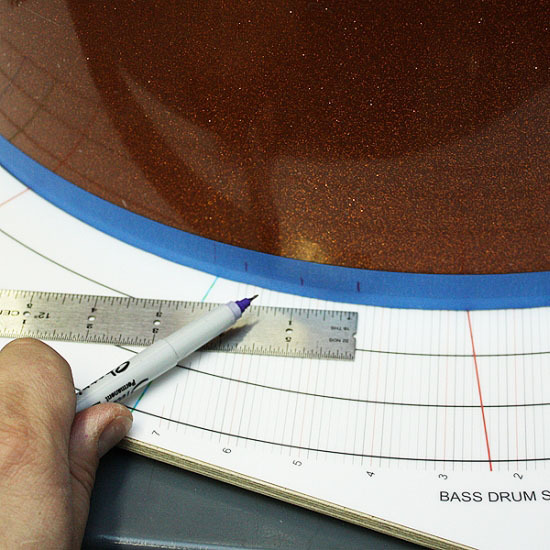 Mark the shell with two marks that are 1 3/4" apart, using the array of lines as the measurement guide. With this particular pair of spurs, the middle set of mounting studs is exactly 1/2 way between the top and bottom, so there are 3 lines. Take note which spur guide lines you used. You will use the exact same lines on the other side to mount the other spur. 4. 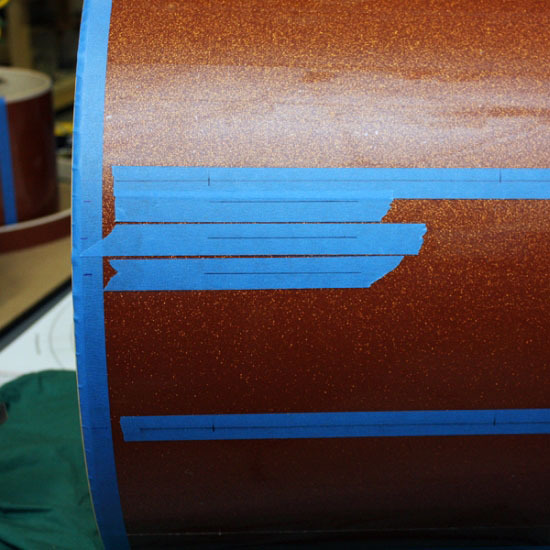 Apply blue tape and strike perpendicular lines down the shell. 5. Tape the lug that is in close proximity to the spur so you can eyeball where the spur should be to avoid interference with the lug. Mark approximately where the spur will be mounted by placing a mark as close as you can to the top mounting stud. It is also a good idea to double check that when the spur is folded back it will not hit the lug near the batter head. 6. Because the mounting studs on this spur are arranged in a diamond shape, the bottom stud hole will be at the same distance from the resonant head as the top stud hole. 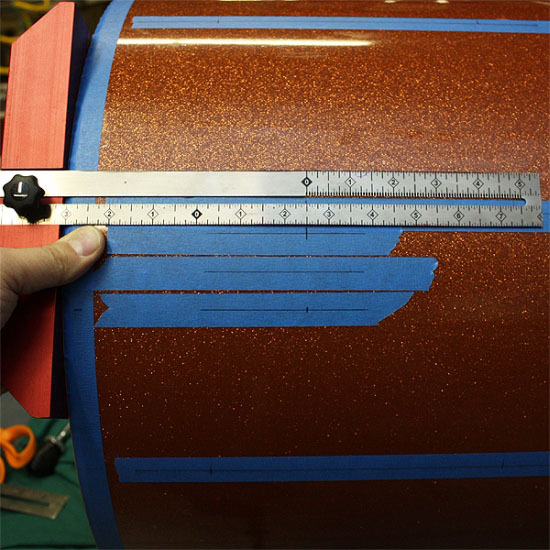 Depending on your particular mount's stud layout, finish off marking the stud mounting holes. It is ALWAYS a good idea to double check the hole placement by mocking up the placement of the spurs. When drilling the holes, keep in mind that all the mounting studs typically protrude parallel to one another from the mount. 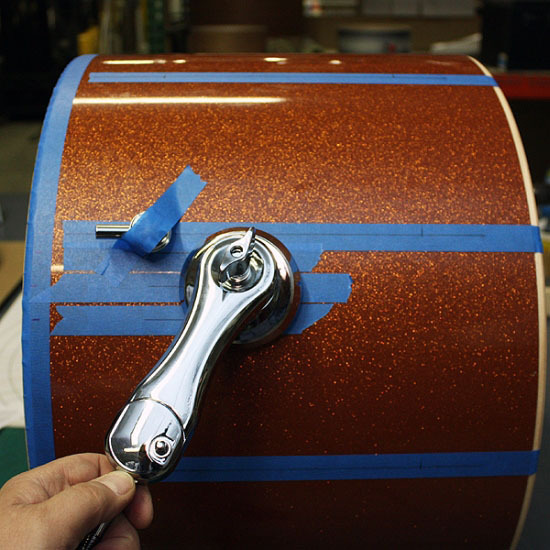 Therefore, it is better to drill the holes in the bass drum at a similar angle to the mounting studs. If you drill all the holes perpendicular to the shell surface, the fit will be tight and/or not work.